After two weeks of oppressive hot, humid weather, I was shocked to hear my furnace kick in last night! The night’s temperatures hit the low 50’s which seems bizarre for Indiana as we head into the month of July. I awoke to a gorgeous morning …. a cool breeze, no humidity, and clear blue skies. It was perfect for some birdwatching, so I grabbed my camera and headed out to the meadow behind my house. As I approached the edge of the field, I was met with a wonderful sweet scent. 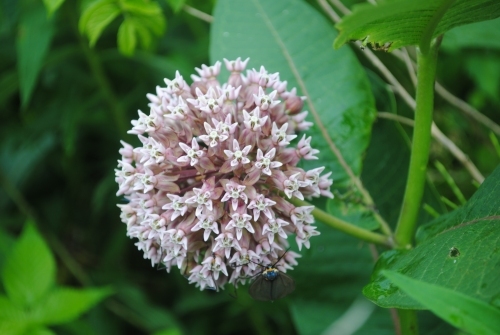 I think you might be surprised to find out the culprit was milkweed which is in full bloom right now. I didn’t seen any new or unusual birds, but I did get a couple of pictures that I think you might find interesting. At the edge of the field is a pair of nesting bluebirds. I’ve been maintaining bluebird boxes for years, and the birds are accustomed to my periodic checks of the boxes. I’ll check this particular box in about two more weeks and might be able to give you a peek at the babies. That will be the last time I check the box until after the young have fledged. 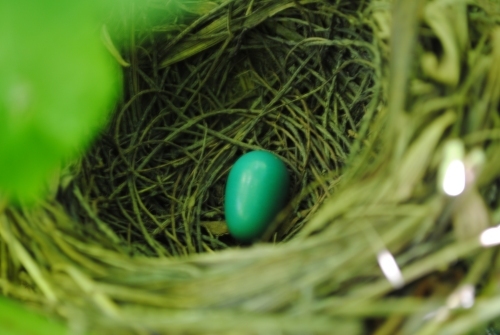 I don’t want to risk causing them to leave the nest prematurely. 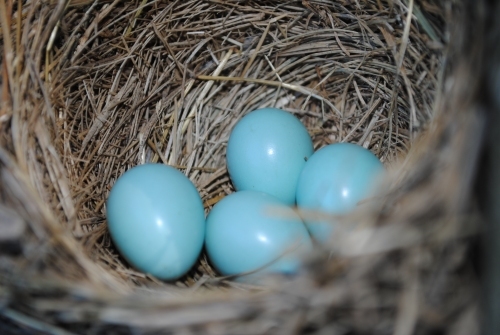 I finally located the catbird’s nest. I knew it was out there somewhere, and I’ve actually been a little worried about it. I found a dead catbird near the house recently and was concerned that it might be the female. My worries were allayed as she sat nearby “meowing” at me as I snapped a couple of quick pictures. I have a problem…. I freely admit it…. I’m a pasta addict. I’ll eat the stuff in all kinds of shapes, sizes, and colors. I’ll eat it with red sauce, green sauce, white sauce, no sauce!. I don’t know if I’ve ever met a pasta I wouldn’t eat. One of my favorite cookbooks (and I have way too many) is The Pasta Bible. If you like to make pasta, and make it frequently, then I highly recommend adding this book to your collection. The spine of my book is broken, if that tells you anything about how much I’ve used it. Like any good addict, I’ve also got paraphernalia to accompany my addiction. My husband is my enabler. He gave me my paraphernalia as a Christmas gift about 14 years ago. My paraphernalia is a Cuisinart pasta extruder. The machine has been discontinued, but the company that made it for Cuisinart is still around, and they manufacture a similar Lello pasta maker. Even better, Lello’s machine costs much less than mine did. Fourteen years of service is a great testimonial to this work horse of a pasta machine. Also, if you own a Kitchen Aid mixer, I’ve been hearing great things about the pasta attachment available for use with it. The following recipe works great for my machine, which does all the hard work. All I have to do is dump the ingredients into the mixing bowl and let it mix for several minutes. Then I stand there and cut the pasta to the desired length as it comes out of the extruding die. Assuming most of you don’t have a machine, I should probably provide a tutorial on making pasta by hand. 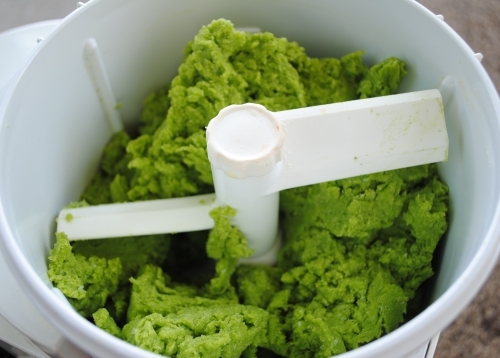 The gal who wrote this tutorial uses a hand crank machine, but you can use a rolling pin. 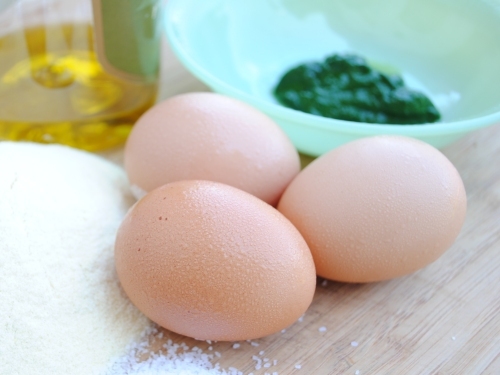 Place the eggs and chlorophyll in a measuring cup and mix together. You need exactly 1 cup of liquid. If needed, add enough water to the mixture to bring it up to 1 cup. Add your liquid ingredients to your dry ingredients according to the method you are using (make a well in the flour and add the liquid ingredients to the well if you are making pasta by hand). It should look something like this when you’re finished mixing. Once your pasta dough is mixed you can roll it out and cut it, or in my case stand there and cut the pasta as it comes out of the machine. I made rigatoni. A few comments on my ingredients. I try to use as many local and organic ingredients as possible. However, I live in a rather remote community where organics can be difficult to obtain. I use organic, free range eggs from my own flock, but organic semolina is a difficult animal to locate and I’ve been forced to have it shipped in. A great place for organic grains and flours is Heartland Mill out of Kansas. Chlorophyll extraction is considered an advanced cooking technique, which I think is ridiculous considering how easy it is. I was surprised to discover that you can’t find much on the Interwebs about chlorophyll in cooking. 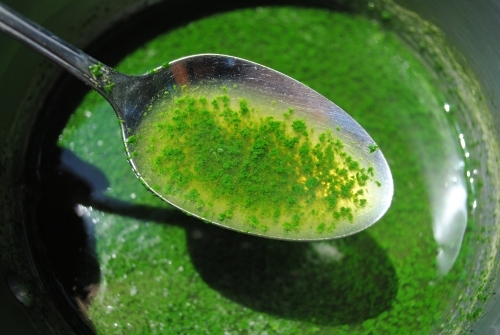 You ask, “Chlorophyll in cooking? Huh?” Chlorophyll imparts a beautiful green, tasteless color to foods. Additionally, it is very healthy. If you’d like to do some further reading, here’s more information on chlorophyll than you ever wanted to know. I’m going to cover chlorophyll in two parts. Part 1 will be extraction. 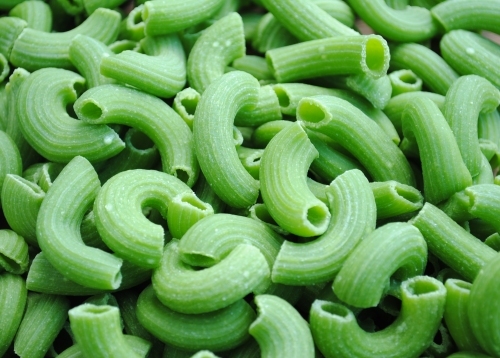 In Part 2 I’ll show you how to use chlorophyll to make gorgeous Pasta Verde. Also, I’ll follow up with a recipe using the pasta to make a salad I’m planning to take to an annual family reunion on the 4th of July. I hate waste. When my spinach or arugula bolts I have a problem with pulling it up and throwing it on the compost pile. Using bolted greens to extract chlorophyll is my solution to “wasting” the leafy greens that I go through so much trouble to grow in my little garden. This morning after the dew had dried, I cut the spinach stalks and stripped the leaves. I ended up with a little over half a pound of spinach. 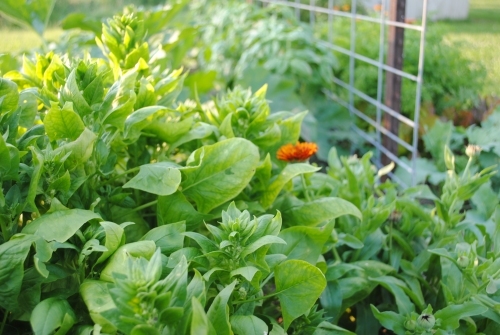 I plant small 18 x 18 inch square patches of spinach and arugula several times throughout the growing season, so I almost always have some available. I have two favorite varieties of spinach. Monstrueux De Viroflay, an old French Heirloom variety, is planted in the cooler temperatures of spring, and again in early fall for overwintering. Summer Perfection, a heat tolerant variety from Renee’s Garden Seeds, is planted once summer temperatures gear up. The next step is to macerate the spinach with some water. 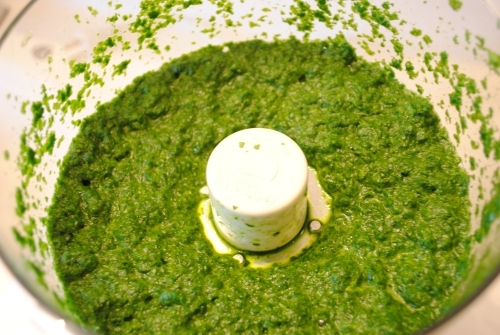 I used about 2 cups of water for my half pound of spinach, placed it in my food processor, and whizzed the behoozit out of it (thanks to my friend Tina for that wonderful new addition to my vocabulary). 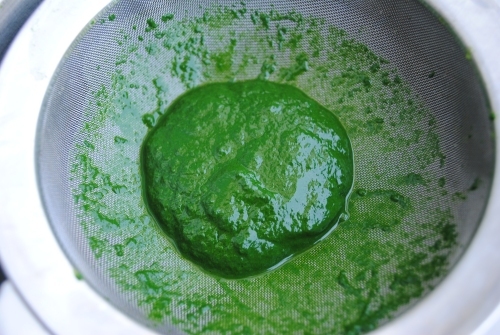 Once the greens are processed, strain the pulp through a jelly bag or a couple of layers of fine cheesecloth or butter muslin to obtain a deep, dark green juice. Squeeze as much liquid as possible out of the pulp. The pulp is what my compost pile finally gets. This next part is the cool part! Place the juice in a heavy, stainless steel sauce pan and gently heat over medium heat to approximately 150 degrees. Be careful not to let it get too hot. 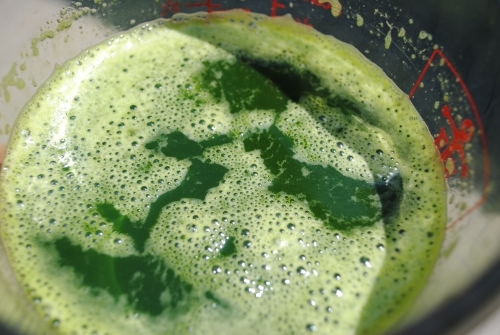 What you’ll be watching for is the chlorophyll to separate from the water portion of the juice. You know you’re there when it looks sort of like algae floating in murky green pond water. Remove from heat and pour the mixture through a fine mesh strainer. Press very gently on the green paste in the strainer to remove some of the excess water (which I throw on my compost pile). The green paste is your chlorophyll. If you won’t be using it immediately, cover and store in the refrigerator. It’s best if used within a couple of days. I’ve never done it before, but some day I plan to experiment to see if it will freeze well. I got about 1/4 cup of chlorophyll from the half pound of spinach. 1/4 cup is what will be needed for a batch of Pasta Verde. Today was my day off work, and instead of doing fun stuff like picking mulberries, I went shopping instead. I bought a new pair of shoes. If you’re wondering why on earth I’m showing you my new shoes, there are a couple of things you need to understand about my life. First, my household consists of myself, my husband, and our two sons. Don’t forget to add my husband’s identical twin and all the other boys hanging out at my house. There is so much testosterone flying around this place, I’m surprised I’m not growing hair on my chest. The other thing you need to know about me is that I absolutely hate to shop. I hate to shop for anything, but I especially hate to shop for clothes. I consider clothes shopping a torturous experience, and I avoid it whenever possible. I tried to show my new shoes to my guys but they looked at me like I had lost my mind, rolled their eyes, and made a few grunting noises. 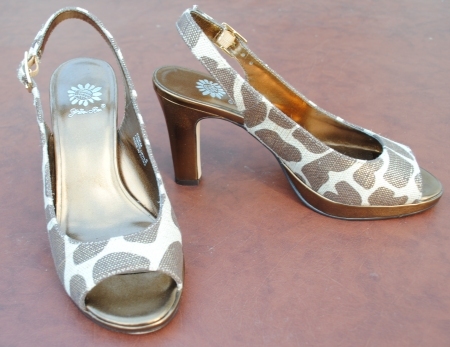 See my new shoes! Aren’t they pretty? Just in case your taste doesn’t run along the same lines as mine, you don’t have to answer that. You want to know what’s really funny? Out of 365 days of the year I probably wear shoes MAYBE 60 days out of the year. Most of that 60 days involves walking in tennis shoes trying to do something about the love affair food has with my hips and thighs. The rest of the time I’m running around in my bare feet. Even at work. Even in winter. Remind me again why I bought a pair of designer slingbacks. The other day on Facebook, I mentioned that I was making a cilantro infused vodka, and my brother in law piped up that I was to use it to make him a Bloody Mary when he comes home for Christmas. My dear BIL is an officer in the Army, currently stationed in Germany, and his wish is my command! Upon experimenting with the concoction I have deemed him a genius! This could easily become a cordial with the addition of simple syrup. 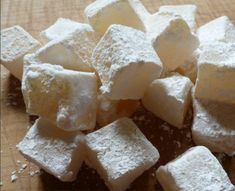 A simple syrup is made by combining equal parts of sugar and water, bringing up to a boil, and then removing from the heat. 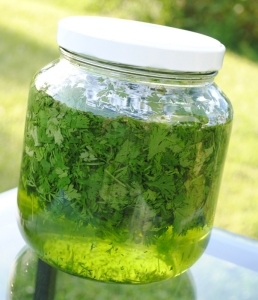 Once the syrup has cooled, add it to the cilantro infusion to taste. Liqueurs should be allowed to age for a minimum of 2 months. Initially they are rather harsh tasting, but mellow and improve with age. Add ingredients to shaker with ice. Shake vigorously. Strain into glass filled with ice cubes. I like mine without the ice cubes. 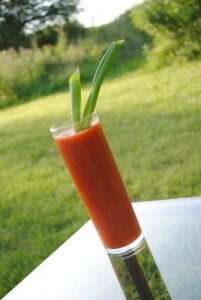 Garnish with green onion or celery (I think celery is an evil veggie, and my hubby is allergic to it). By the way, the drink is named in honor of my brother in law. It comes from an old nickname, Rogelio Anti-Suave. Don’t ask.